ConceptDraw DIAGRAM is a flowchart software. This software includes flowchart diagram examples set. Libraries contain vector stencils that allow users to use RapidDraw technology. Users can start draw their own flowchart diagrams from existing examples by clicking on direction arrows. Sample 1. Flowchart - Synthetic object construction. This flow chart example displays planning scheme for the construction of a synthetic object. ConceptDraw DIAGRAM v12 is a business flowchart software includes the wide flowchart examples package. Use ConceptDraw DIAGRAM v12 diagramming and vector graphics software to visually model your own IT construction processes. Draw your own business process flowcharts using ConceptDraw DIAGRAM v12 diagramming and business graphics software. 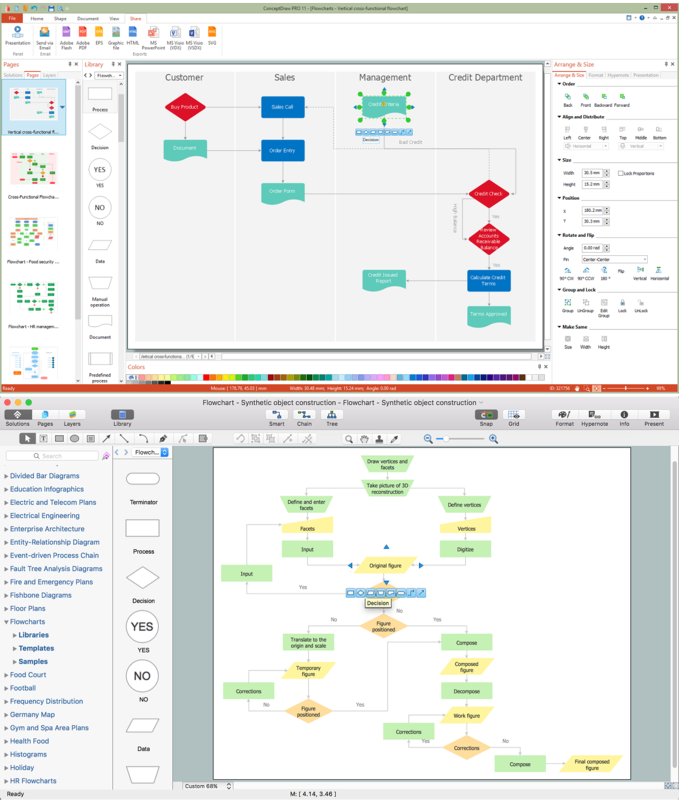 The Flowcharts Solution for ConceptDraw DIAGRAM v12 is a comprehensive set of examples and samples in several different color themes for professionals that need to graphically represent a process. Start your business process mapping with conceptDraw PRO and its Arrows10 Technology. Creating a process map, also called a flowchart, is a major component of Six Sigma process management and improvement. Use Cross-Functional Flowchart drawing software for business process mapping (BPM). Use a variety of drawing tools, smart connectors and shape libraries to create flowcharts of complex processes, procedures and information exchange. Define and document basic work and data flows, financial, production and quality management processes to increase efficiency of you business.